Easy and fast remote support and desktop sharing directly from your chat! 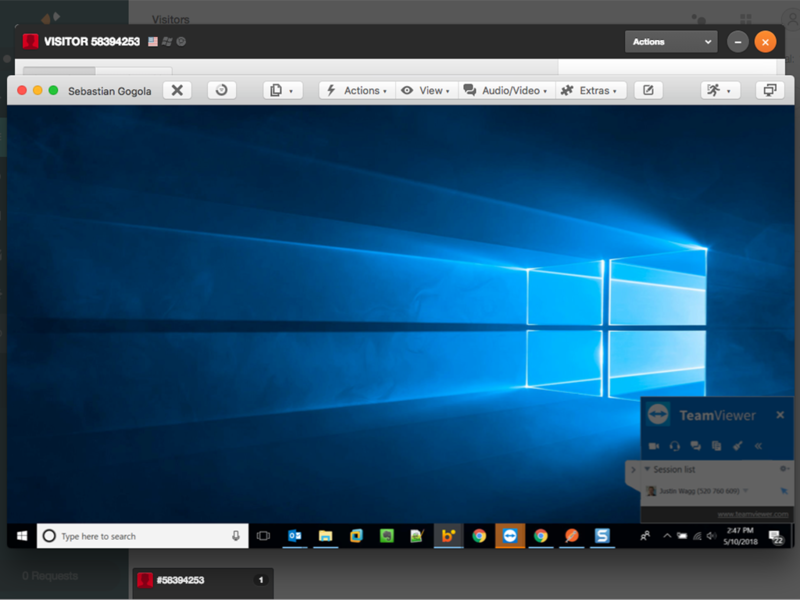 TeamViewer is the No.1 solution for remote support and desktop sharing regarding market share with over 1.5 billion installations worldwide, 20 million connected devices at any given time and translations in more than 30 languages. Multi-Platform: Support for Windows, Mac, Linux, Android, iOS, Chrome, and Blackberry. 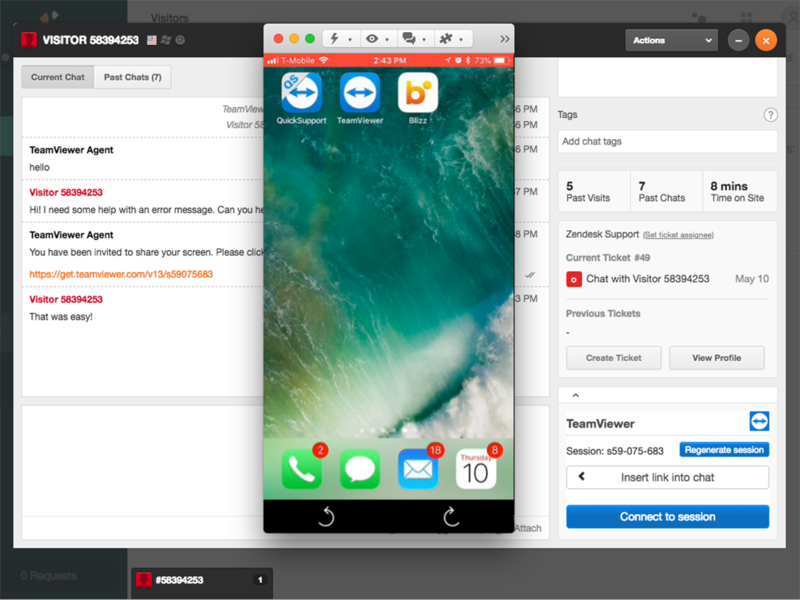 Feature rich: Use all TeamViewer features including multi-monitor support, file transfer, chat, VoIP, video, customer management, setting policies, whiteboard, session recording, 24/7 access and many more. No configuration required: Works instantly behind any firewall and proxy. High performance: Intelligent connection routing and bandwidth usage for real time screen sharing even under bad network conditions. High security: TeamViewer utilizes RSA 2048 public/private key exchange, AES (256 bit) session encryption end to end, random passwords for one-time access, optional two-factor authentication, and access controls via trusted devices as well as black- and whitelists. 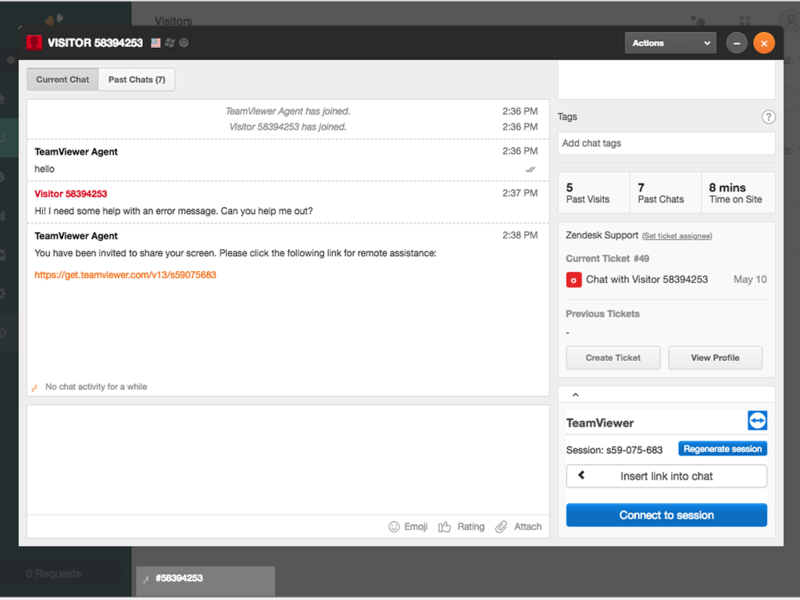 Please note that using TeamViewer with the Zendesk Chat integration will require the latest TeamViewer version or being on subscription. Install the app from the Zendesk Chat App listing page. Click Install and you are good to go! Customer waiting message The message that will be displayed to your customers while they are waiting for your supporter to connect to the TeamViewer session. Customer link text Choose which text is inserted into your chat by the Insert link into chat button. Use @@URL@@ as placeholder for the actual session link. If left completely blank, the session link will be inserted in a new line. * Enable role restrictions Here you can restrict availability of the app to certain roles. This is an app. It will install right into your Zendesk Chat account.